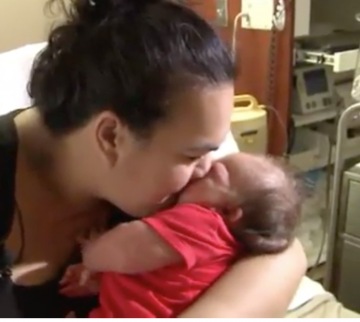 This Mom Just Gave Birth to a 14-Pound Baby! You won't believe his totally appropriate name. When you decide to name your baby after a biblical character, you've probably got some pretty big expectations. But Kansas couple Les and Gina Hilton definitely got more than they bargained for when they recently welcomed their third child, a baby boy with the aspirational name Moses William Hilton. For the uninitiated, the name Moses means "one who delivers" (just Googled that! ), and even though the little guy arrived 11 days early, he's already living up to the moniker—the newborn clocked in at an impressive 14 pounds, 22 inches. That's almost six pounds heavier and two inches longer than a typical newborn. Or to put it a different way, he's about the size of a watermelon! "When the nurse took him out, she said, 'It's a mini sumo wrestler,'" Hilton, a mom of three, explained to KAKE. "Then they showed me him and I was like, 'That is a sumo wrestler!'" Pretty crazy! And get this—Moses' size may be grandiose, but the little guy (can we still call him that?) didn't even come close to breaking the Guinness World Record for 'Heaviest Birth'—the number to beat is actually 22 pounds (say what?!). Can you even imagine what it must be like to push out a baby that size? I can't. My kids were both born early—my daughter weighed in at just under four pounds, and my son was a little over five. Moses is three times that size—ouch! Gina and Les were expecting a big baby, though—somewhere around 10 pounds, since their daughters weighed nine pounds each. But they definitely were not expecting a 14-pounder, and in fact, even the hospital staff was taken aback by Moses' size. "Just surprising how different it feels to hold a baby that big, and just to look at a baby with those chubby cheeks," said Jill White, nursing director of the birthing center at Hutchinson Regional Medical Center. "They're even chubbier than what you'd normally expect on babies." Of course, with size comes expectation. So now in addition to his name, baby Moses has something else to live up to. "I was thinking [he'll be a] linebacker, [or play] basketball, you know, all kinds of different sports," joked Les. "But in reality, all I want is him to be healthy and happy."